Water pipe filtration in a portable size! This showerhead perc hammer bubbler is a great piece for anyone looking for the water filtration of a bong but also the portability of a hand pipe. The main chamber features a showerhead perc for smoke filtering and diffusion. The ribbed design although primarily for design purposes actually helps to spread out your smoke for more smoke cooling. This piece features an 18mm female joint and includes a dry herb bowl. I love how it looks and it hits great. 2 reasons i have given it 4 instead of 5. Because of what a steep angle the bottom of the chamber is at, when i place it on the table water drips down the mouth piece and on to the table. I tried putting less water, but what ive realized is that the suction from when you inhate lifts the water enough to where it gets down the mouthpiece anyway. Maybe a slighter angle on the bottom would help. Also the hole in the bow piece is waaaaay to big. Everything falls thru. Outside of that though its very nice. Great little piece. 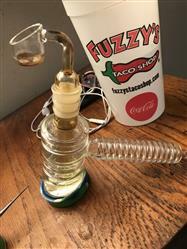 Hits like a big bong, portable like a bubbler. Very smooth hit, takes barely any water. Would recommend especially for its price. Only negatives: somewhat hard to clean so I recommend changing water often, easily can fall over so be careful, and the water can sometimes pour into your mouth if you’re smoking while laying down.